Corpus Christi Friends – we are deeply sorry that it was not possible to make time to visit with each of you. Our schedule was just too tight. We will be back in Corpus Christi over Thanksgiving weekend and would be happy to make time for a visit then. We left Camping World on Thursday 10/25 later than planned. We were taking care of Gage over the weekend while daughter Laura was away for the weekend at a women’s conference. 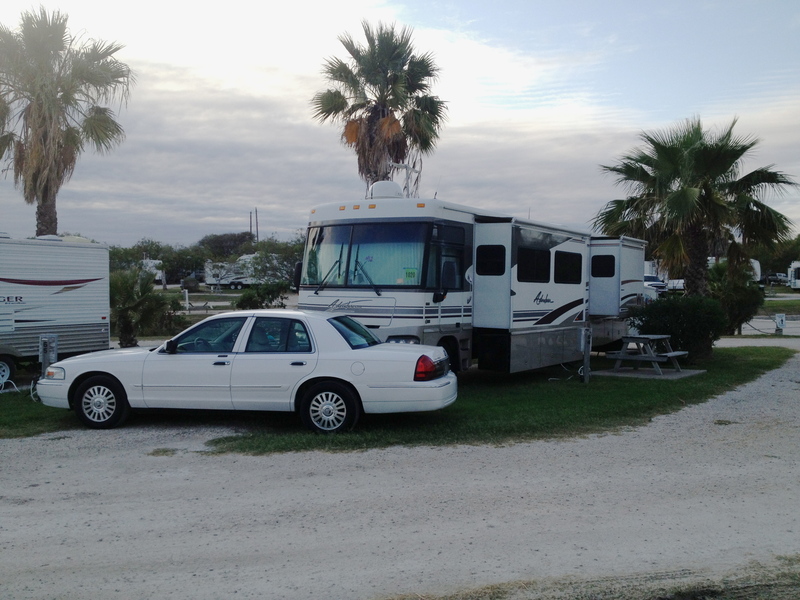 Since we traded our truck and fifth wheel for the motor home, we had no wheels while in Corpus Christi. Fortunately we were able to arrange a borrowed vehicle. The first challenge was for me to navigate the parking lot at Radiology Associates in Corpus Christi with a 38 foot motor home. This is where Carol was picking up our loaner car. After dropping Carol off, I drove to Sea Breeze RV Park in Portland. I was on the Crosstown expressway and realized that Carol had not secured the passenger window shade. 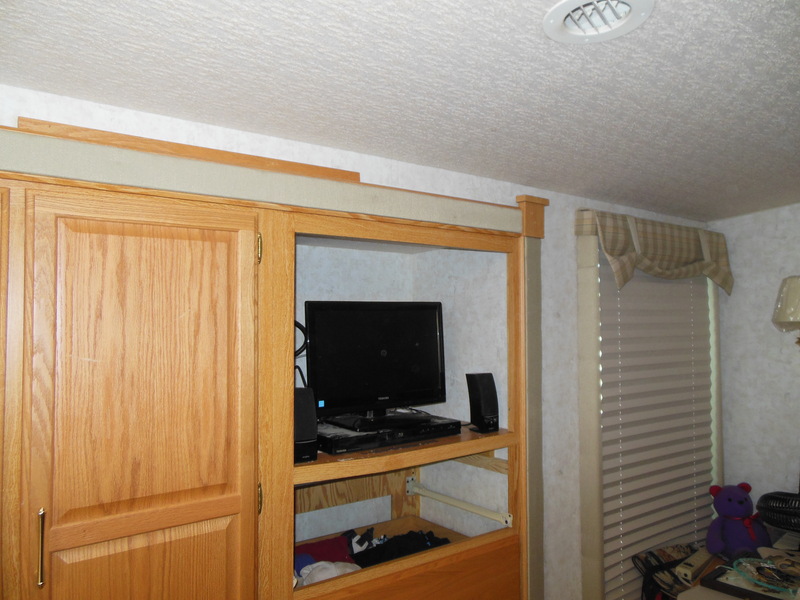 For those unfamiliar with motor homes, there are two window shades up front that wrap around the side windows and continue to the cover the windshield. As I slowed on the expressway, the passenger shade began to roll in its track to cover the complete passenger window. Fortunately I was in the right hand lane so I was able to pull over to secure the window shade. Back on the expressway now, I head for Portland. GPS lead me directly to the correct road except it did not warn me about road construction. To make matters a bit more confusing, signage was not very clear on where the entrance to the park was. I decided it was time to stop and call the park. Keep in mind that I have a small U-Haul trailer behind the motor home, I have no back-up camera and Carol is not with me. As I looked up the number for the RV Park, A nice gentleman walked up on my side and told me to just keep driving through the construction, I would come to the entrance to Sea Breeze at the end of the road. I thanked him and carried on. When I checked my review mirror, I saw about 5 cars behind me. Since it was nearing 5PM, I am sure these folks just wanted to get home. When Carol called to let me know she was on the way, I warned her about the construction zone so she too would not be confused. After Carol arrived at the motor home with Gage, she went in to pick up a change of cloths since she was staying with Gage at Laura’s apartment. While she did that, Gage and I took the doggies for a walk. We decided to go to Pepito’s in Portland for dinner. We’ve been there before so we knew we were getting authentic TexMex Corpus Christi style. After dinner, Carol took Gage back to the apartment so she could get hm to school Friday AM. I soloed in the motor home Thursday evening so things were very quiet for me. 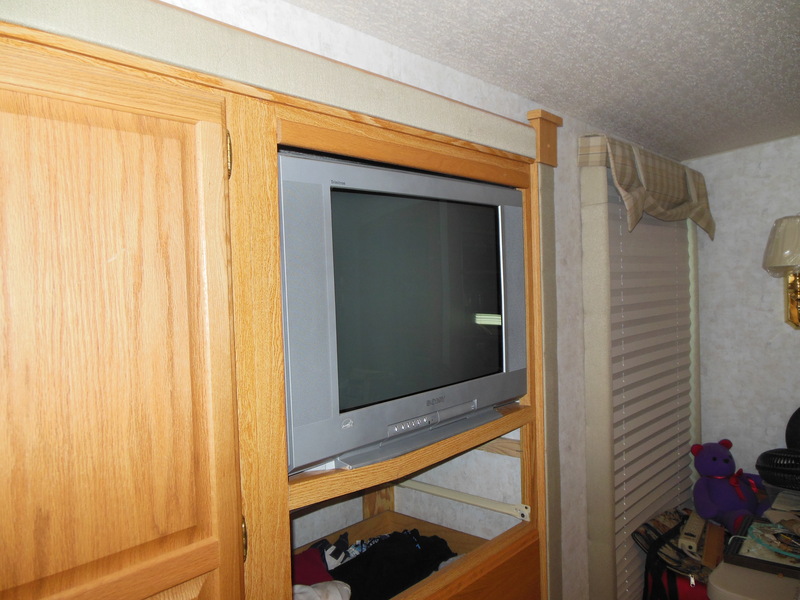 The motor home had two 2004 vintage TVs that had to come out. 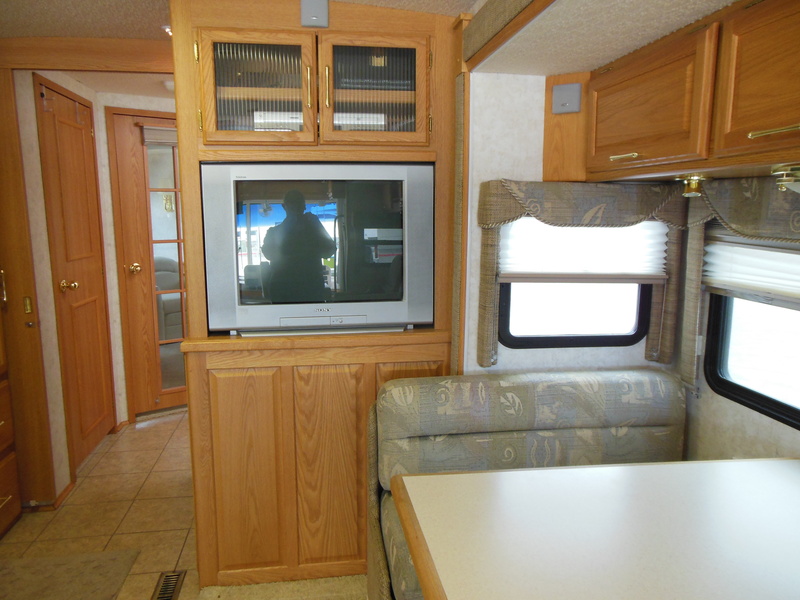 We had our HDTVs from the fifth wheel stowed away in the motor home. Friday while I waited for Carol to come back to Portland, I pulled the smaller of the two TVs. Here you can see the 24″ Sony CRT TV that was in the bedroom. Because of the weight of this monster, it was pretty secure in the space. I was able to get it removed and set our small bedroom HDTV in the spot – it looks a bit puny. When Carol arrived, I loaded the TV in our borrowed car. It would be going to Driscoll Children’s Hospital resale shop (aka, Cottage Shop). Friday we had several errands to run including a visit to our audiologist for a little tuning and cleaning for our hearing aids. By the time we got all of that done, it was time to pick up Gage. Our plan was to bring him to the Motor Home where he would spend the night with us. Saturday morning we headed to Town and Country for breakfast to meet with our long time friend Margaret and Margie. After a too short visit, we embarked on a car hunting expedition. I won’t give you the blow-by-blow details of the expedition. Instead, I’ll say that Champion Ford came through for us. By 5PM we had signed on the dotted line and got the key to our 2006 Grand Marquis. Gage was a trooper while we visited about 6 dealers and looked at a bunch of cars. Saturday night, he had a party with his Karate group, so Carol stayed in Corpus Christi, while I went back to Portland. Sunday AM, Carol came back out to Portland with Gage. 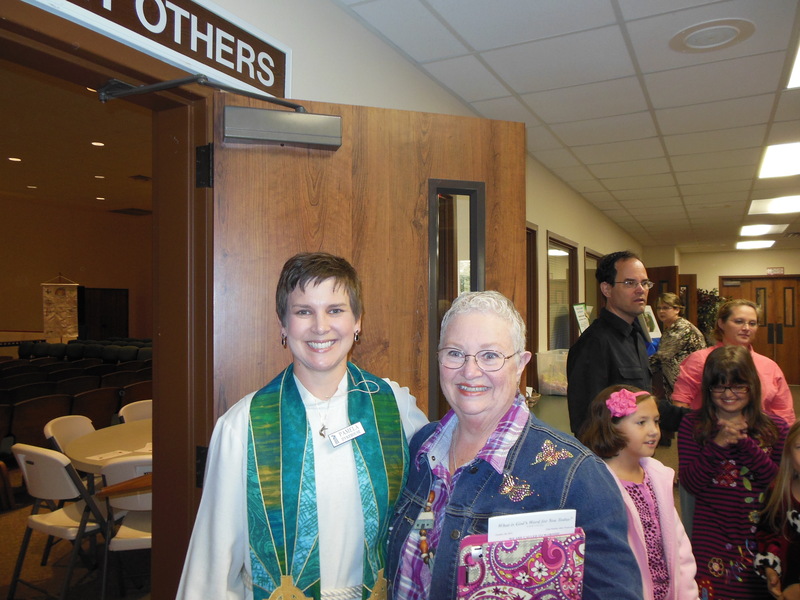 We went to First United Methodist Church to see our friend and former pastor, Pamela Dykehouse. After another too short visit, we parted ways. It was good to see her again. I do not remember what we did next. I think we made a couple of trips back to Corpus Christi so Carol could have our new to us car. Laura would be coming home late Sunday evening and Carol want to get back to Portland. Monday, we worked on getting the other CRT TV out of the cabinet. It was a 27″ which means it weighs a bunch more than the 24″. This cabinet space will be converted to a much-needed kitchen storage area. (PS, this photo is before we moved in.) To get this TV out of the cabinet, I had to remove our washer/dryer which is in the space directly under the TV. I managed to get this TV out of the motor home without dropping it or injuring myself. The TV and the VHS/DVD player would also be going to the Cottage Shop. By Tuesday, we finally had a chance to sit a relax a bit. We had a chair in the motor home we did not need. We also had a 6-foot table we could not fit into any storage bay. Laura would be getting those. She had the couch-bed that was in the fifth wheel that we needed to get back to Camping World. That exchange happened Tuesday evening. Wednesday, I spent the better part of the day unloading our U-Haul trailer so we could get the couch-bed in there. While this was going on, Carol was busy on the phone talking to insurance, extended service, road side assistance people. Also, she was checking with Camping World to see if they have all parts in-house for the final repairs they need to make. Once all that was confirmed, we decided to head for Camping World in New Braunfels late Wednesday afternoon. We would spend the night in CW parking lot so we would be there first thing in the morning. We hit San Antonio after the evening rush hour traffic so we had pretty smooth sailing all the way to our overnight stop. Tired and still exhausted, we crashed. Thanks for stopping by, y’all come back now for the rest of the story. This entry was posted in Texas and tagged backup camera, Crosstown Expressway, rv park. Bookmark the permalink. Sounds like a busy and stressful week. Now time to relax a little.